The all inclusive resorts of the Riviera Maya (Hacienda Tres Rios for instance) have everything a vacationer needs, a beach, a pool, endless activities and entertainment, plus all meals and drinks are included. The fact is you never really have to leave the resort. However, the Yucatan Peninsula (home to Cancun, Playa del Carmen and the Riviera Maya) has so much to offer, that you might want to get out once or twice and explore the area. Many people visit Mayan archaeological site Chichen Itza or Xcaret Park, both wonderful choices, but here are a few “off the beaten track” suggestions for Riviera Maya day trips. Ruta de los Cenotes (Cenote Trail) is located in Puerto Morelos, the small fishing village that is 20 minutes south of Cancun. Cenotes are freshwater sinkholes that the Mayans considered portals to the underworld. Each one is unique and beautiful in its own way. The best way to visit Ruta de los Cenotes is to rent a car. There are countless cenotes to explore, some of which have zip-lines, hammocks and diving platforms and charge a small entrance fee. Chichen Itza and Tulum are the most commonly visited Mayan ruins sites in the area, but at Coba, located about 60 miles east of Chichen Itza, visitors can still climb the Nohoch Mul pyramid, which is the tallest one on the Yucatan Peninsula. You’ll have to climb 120 steps up 137 feet! Coba is also home to two lagoons, which are not public and can only been seen from the top of the pyramid. The best way to visit Coba is to take an organized tour or rent a car. Tip: Wear light comfortable clothing and shoes, a hat and bring extra sun block and bottled water. Laguna Yal-Ku (Yal-Ku Lagoon) is a breathtaking inlet located outside the beach town of Akumal, which is about 20 miles south of Playa del Carmen. Yal-Ku’s cool turquoise waters are calm which makes it ideal for snorkeling. 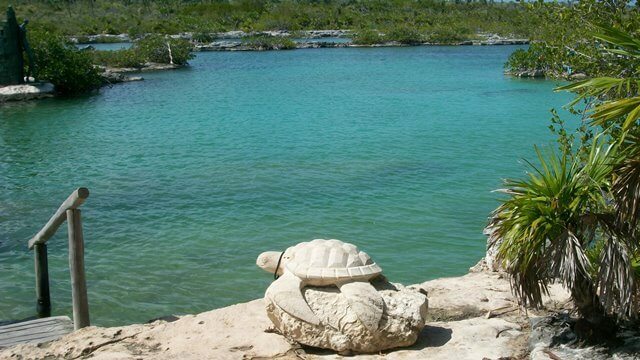 Visitors will see several species of tropical fish and underwater limestone formations. There is a small cover charge and snorkel equipment and lockers available for rent. There is also a snack bar at Yal-Ku and lovely sculptures scattered throughout the grounds. The best way to visit Yal-Ku is to take the ADO bus to Akumal and then take a taxi to the lagoon. Tip: Bring biodegradable sun block or snorkel in a rash guard, as regular sun block is not permitted. There are many eco-parks in the Riviera Maya, but Kantun-Chi is more natural, without all the huge advertising campaigns and countless tour buses. Located about 15 miles south of Playa del Carmen, Kantun-Chi is home to four different cenotes, in which visitors can swim and snorkel. The best way to visit Kantun-Chi is to rent a car or take a taxi and arrange for the same taxi to pick you up. The entrance fee is 29 usd. 49 usd will get you a guided tour of the four cenotes and 79 usd will get you the guided tour (which includes an underground cavern) and a delicious lunch. The property is very clean and well-maintained and there are no crowds at Kantun-Chi so you’ll feel like you have the place to yourself. Tip: Snorkel equipment is not included if you do not pay for a guided tour. 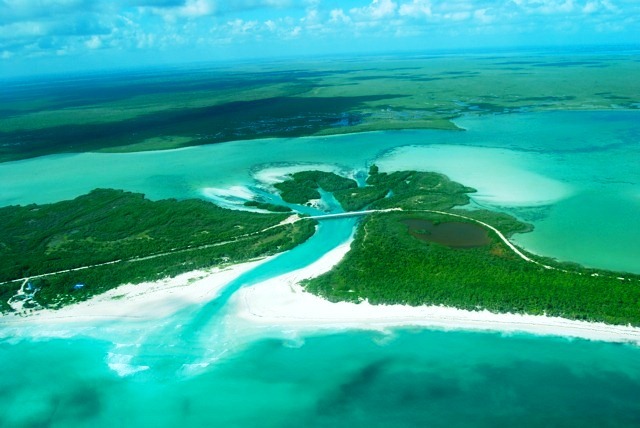 Sian Ka’an Biosphere Reserve is located just south of Tulum, some 40 miles south of Playa del Carmen. Made up of 1.3 million acres of pristine, natural, protected land, Sian Ka’an is a UNESCO World Heritage Site, is home to 23 known archaeological sites, 336 known bird species, 103 known animal species and is an important nesting site for two endangered marine turtle species. You won’t find any all-inclusive resorts here, just a few small eco-friendly off-the-grid inns and private villas. Various boat, kayak and fishing tours are available through CESiaK (a non-governmental organization). The best way to visit Sian Ka’an is to take a tour. Tip: If you choose to rent a car and visit Sian Ka’an on your own, rent a 4×4 as the unpaved road is quite bumpy. Tell us about your favorite off-the-beaten-path place in the Riviera Maya in the comments below.